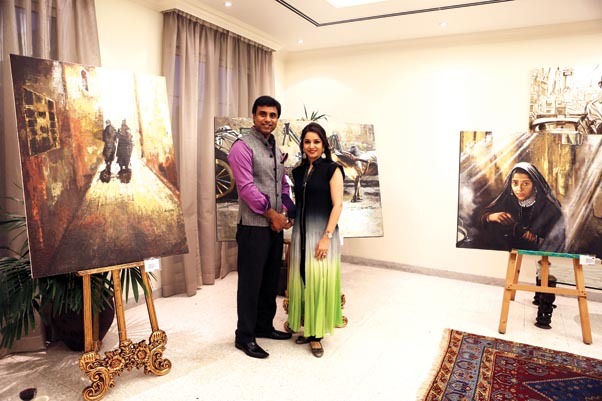 Artist Nidhi Kakar recently held a two-hour exclusive private viewing of her maiden art exhibition ‘Expressions by Nidhi Kakar’ at her residence. Devoted to expressions that exist in everyday life, this spectacular show was an exploration of intrigue through expressions as they create the important ‘third dimension’ to what a mere reflection cannot capture. 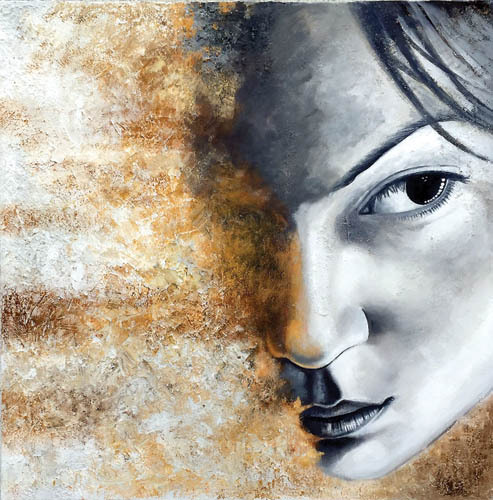 The acrylic on canvas art exhibits at this exquisite viewing portrayed the artist’s journey into art inspired by the essence of individual expressions at a deeper level, and their relationship to what lies within, which the eye cannot easily see. 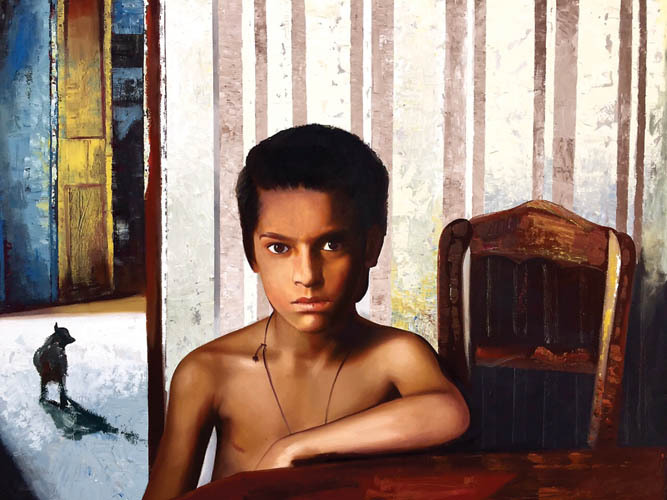 Organised at her Jumeirah residence, ‘Expressions by Nidhi Kakar, primarily showed works in acryAv lic on canvas displaying an array of different and unique expressions, depicting real-life human emotions like joy, sorrow, pain, fear, destitution, hope, despair, strength, etc. The imaginative and creative use of bright colours and human figures and expressions from real-life situations led to a vivid portrayal of the specific emotions which the artist has attempted to highlight. The paintings were done in several sizes, some as large as 140cm x 100 cm, displaying large works using the medium of acrylic on canvas intelligently and creatively, to create a multi-dimensional painted impression of reality that we see in this world. While the paintings did display stark realities of life, the message was one full of hope in a background that appeared dismal, of company despite solitude, or of hope in adversity. Some striking examples of renditions were ‘Radiant Hope’, ‘Silent Company’ and “Eyes Wide Shut’, each with a strong message. 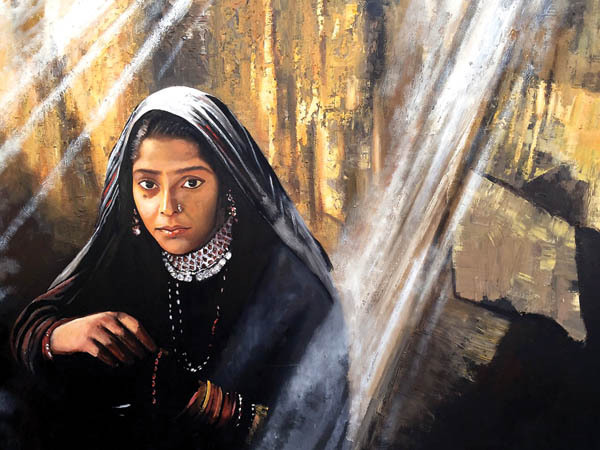 Radiant hope depicted the empowerment and emancipation of women, through the creative use of light rays to reflect the hope that a village girl exudes. Similarly ‘Silent Company’ is a beautiful expression of how one can be in company and draw comfort with words unsaid, depicting the power of reticence. And, of course, ‘Eyes Wide Shut’ was another creative piece of art that stood out in its use of colours and striking imagery with shut eyes almost staring at the viewer with a powerful message of being able to see ahead, despite the eyes being shut. All renditions reflected not just the skill of the artist, but the intellect of the thought behind the artist’s motive to produce the art. This unique style is one that appeals in our modern world where messages of empowerment, hope, gender emancipation, challenges of age, etc are becoming more germane. It is this genre of ‘Intelligent art’ – as the artist prefers to call her art, that goes beyond viewing pleasure to providing important topical messages of global significance and inclusion. Born in 1965 in New Delhi, Nidhi Kakar graduated with a Masters degree in Nutrition. She also trained to become a teacher and educator and obtained a degree in education. With a childhood passion for art and painting, she has been consistently receiving training in fine arts, drawing and painting, under the guidance of several artists who have had a profound impact on her style. 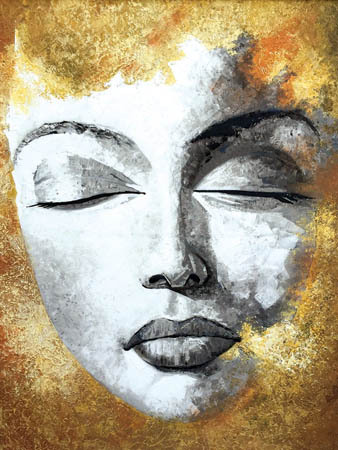 Her art style has evolved over time, during her travels and day-to-day experiences, which have been significantly impacted by her experiences of having lived in four countries – India, Egypt, Turkey and the UAE. She has travelled around the world extensively which has made her aware of and sensitised her to global realities and the commonality of issues across borders. Am totally mesmerised with the paintings & the message conveyed.Truly beautiful sets of expressions!! !